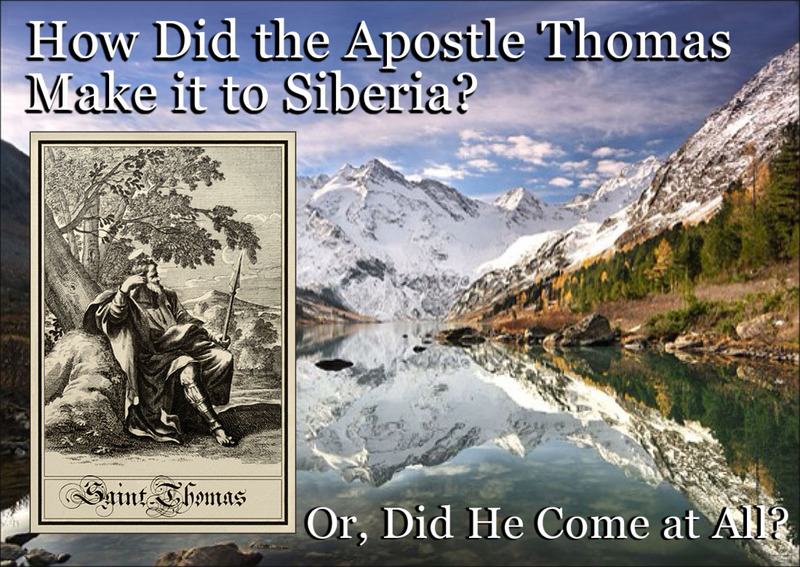 PreMormon.com - Home - Apostle Thomas in Siberia? Go to Part Two: Site History & Info. A Delusion! No! The Last Dispensation! A Conspiracy! No! Ministering of Angels! The Gathering of Israel! No matter what conclusion people may reach regarding the true nature of Mormonism, all can agree that the system and its followers did not suddenly appear, from out of nowhere, when the latter day "Church of Christ" was established on April 6, 1830. Some observers trace the movement's roots back to the early part of the 19th century, within the confines of the Joseph Smith, Sr. family. Other students of the "Restoration" claim its beginnings were set in motion in the Garden of Eden, if not before that time -- perhaps before the very origin of life on this planet. In the year 1227 Genghis Khan, the "Power of God on Earth" and the "Emperor of all Mankind," died and was buried in Mongolia. Of course Mongolia in those days was a rather extensive and ever-changing domain -- and the secret location of the dead Khan's tomb could conceiveably have been just about anywhere between the Ural Mountains and the Pacific Ocean. 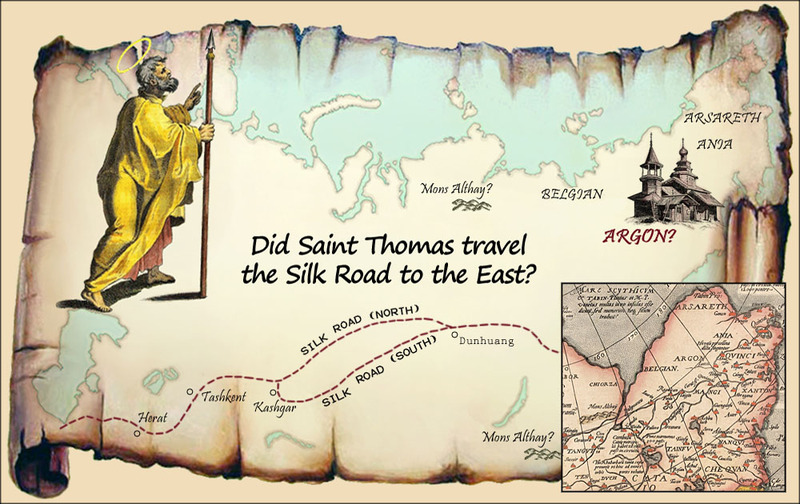 The Venetian adventurer, Marco Polo, passed along a dubious claim, in his c. 1300 Travels, that the Mongol Emperors were buried at "Mons Althay" (wherever that undefined place may have been -- it evidently was not in the similarly named Altai Mountains of western Mongolia). Genghis (real name Temujin) was succeeded by Tolui Khan, one of whose sons was the famous Kublai Khan (the Emperor who played host to Marco Polo). A brother of Kublai took over Persia and adjacent areas, establishing an offshoot of the Mongol Empire, called the Ilkhanate. He, in turn, had a son named Abaqa and a grandson named Arghun -- both of whom ruled the Persian-centered Ilkhanate respectively. 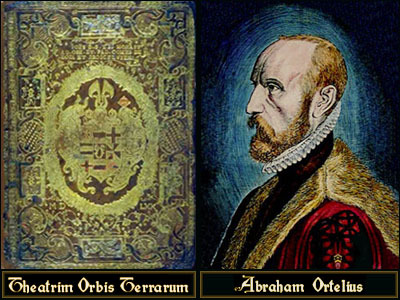 The latter ruler was something of an anomaly, in that he ordered one of his sons to be baptized a Christian at birth. 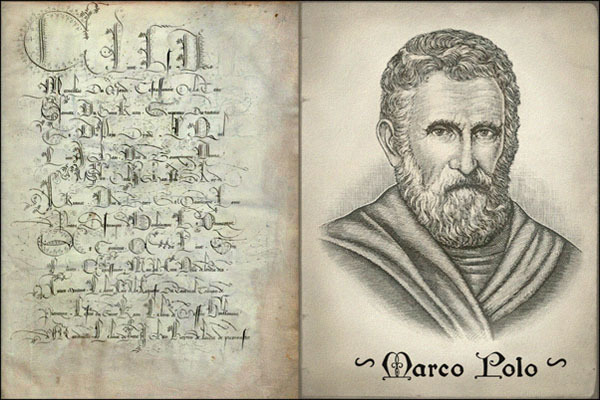 Since Arghun's name was sometimes spelled "Argon," the infant may well have been one of the first "Argon Christians" (yet another example of Marco Polo's ill-defined terminology). Although his headquarters was at Tabriz, west of the Caspian Sea, Arghun/Argon was supposed to be buried at "Mons Althay." To confuse matters even more, poorly informed European map-makers subsequently placed a city (or tribe? or kingdom?) called Argon, in Siberia, far to the east of the Mongolian royal tombs. Title page of Polo's c. 1300 book and imaginative portrait. 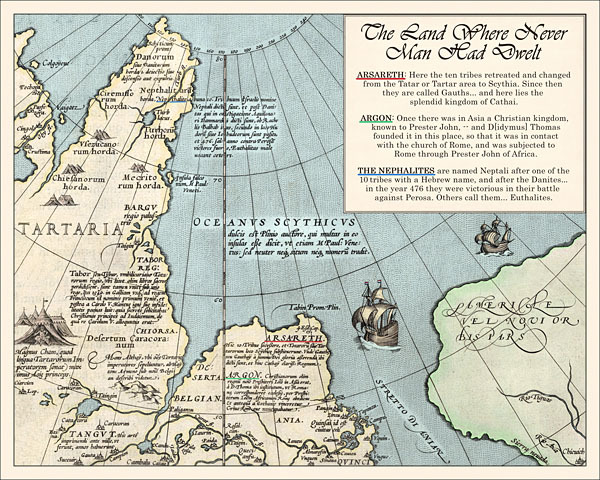 The 56th Chapter of Book 1 in Polo's Travels, (in English translation) reads: "Of The Province of Tenduk, Governed by Princes of the Race of Prester John, and Chiefly Inhabited by Christians." In the opening passages of that chapter, the author mentions the fact (?) that the province of Tenduk (evidently lying somewhere between Lake Baikal and the Argun River) was then (at the end of the 13th century) ruled over by "a descendant of Prester John," whose given name was George and whose royal and ecclesiastical title was also "Prester John." Although Polo identifies one portion of this Nestorian (?) king's subjects as "being also Christians," and another portion being of "a class" named "Argon," he does not clearly state whether or not the Argons are Christians. All the reader can discern is that the Argons had as their ancestors both the native pagans of Tenduk and Muslim converts, who presumably arrived from the west. In Book 3 of his Travels Polo writes extensively about the recently deceased Ilkhanate ruler, Argon. This leader's realm was far removed from the Tenduk and Prester John of the Lake Baikal region, and yet Kahn Argon also ruled over some Nestorian Christians. And, as mentioned above, even had his heir to the throne baptized a Christian. Polo provides no evidence linking these two, widely separated groups of Christians; but might there be a connection, nevertheless? Perhaps so; because the historical "Argon Christians" were the Basmyl tribes of Altai Mountains. These Turkic peoples joined with their neighbors in the 10th century, to form the short-lived Kara-Khanid Kahnate, a domain streatching from the Altai Mountains in the east, to the shores of the Aral Sea in the west. In the modern era they have mostly congregated in nothern Kazakhstan, around the city of Astana, and are known as the Argyns. Although they are today nearly all Muslims, in Khan Argon's day they would have been his Christianized neighbors, living in the adjacent Changatai Khanate (which bordered Argon's realm on the east). 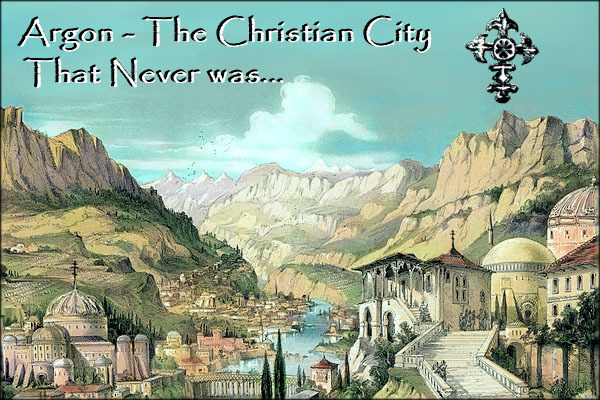 All of this being said, the Christians of Khan Argon's Ilkhanate were more likely resident Nestorian converts, including the descendents of the White Huns, who petitioned the Patriarch of that church to send them a supervising bishop, centuries before the Mongol expansion. The White Huns (who defeated the Sassanid Persians at the Battle of Herat in 484) were more likely to have encountered one of the first far-wandering Christian missionaries, than were the Basmyls or the mysterious subects of the legendary Prester John, farther to the east. And, as coincidence would have it, the traditional apostolic missionary to Parthia (Persia) was the biblical "Thomas called Didymus" (and later recognized as a Saint by all the major sects of Christianity). Add to all of that, one more interesting historical oddity: these White Huns were also called the "Nephilites" and 16th century map-makers showed them residing next to Argon in eastern Siberia.